I have been blessed with a fun mom and I'm trying to remember the things she did so that I can pass them on to Fynn. He's being a bit of a picky eater right now. He takes bites great, and chews them, but then he spits it out and tries to throw it on the floor! I got him to eat a bit last night, though, by making one of our old favorites: Mac & Cheese and Hot dog Octopus. Or Quadpus as the case may be. Boil until the arms curl and use to top the noodles! I am having so much fun going to the library and reading books with Fynn. There are just so many I really love, I have a hard time choosing! I just thought I'd post about some of my favorites for those with similar tastes (and so I can remember them for futures). 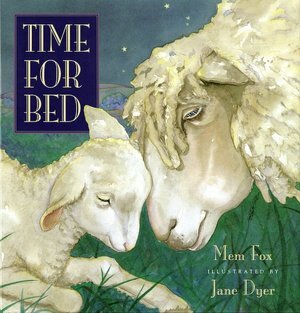 Right now Fynn's favorite is Time for Bed by Mem Fox. (Check it out at Barnes & Noble). He wants to read it every night! Ages: 6 mo. - 3 yrs. Format: Large board book = not easily mangled by sharp new teeth. My nephew has that book and loved it at that age too!